← Etiquette At The Theater/Movies, Or Why Can’t People Ever Remember To Turn Off Their Cell Phones!? A lot of our notions of etiquette come from the Victorian era when the middle class was on the rise and everyone wanted to show everyone else how on point they were with all of the intricacies of etiquette. One area that was particularly elaborate and somewhat gruesome to us today is the etiquette of mourning. A widow was expected to be in deep mourning of her husband for two years. Then a third year was “ordinary” mourning, and the FOURTH year was considered “second” or “half” mourning. Many older women remained in mourning for the rest of their lives, the most famous being Queen Victoria who was in mourning for her husband, Prince Albert for more than forty years. Widowers were expected to mourn for a year. Parents and children were mourned for a year, siblings and grandparents for six months, aunts/uncles for three months, and cousins for six weeks. For a funeral, everyone had to wear black (unless the funeral was for a child or unmarried girl, in which case everyone wore white). Sometimes the family/funeral director would even provide black gloves and scarves for all the mourners. Etiquette dictated what you could wear while you were in mourning (in relation to how much time had passed and your relationship to the deceased) right down to what kinds of fabric and jewelry was appropriate. Men only had to wear a black armband over their regular clothes (though they were supposed to wear only white shirts instead of colored.) This was partially sexist and partially practical. Men’s clothes were much more difficult to dye than women’s clothes and typically when you were in mourning you would just dye all your clothes black instead of buying new, black clothes. The sexist reason was that men still had to go out and go to work and didn’t want to look too depressing. Women did have to wear all black. In addition, it couldn’t be just any black, it had to be very matte black, so you will see a lot of references to crepe/crape as a fabric choice (a slightly crinkly fabric that does not reflect any light.) Women also had to dress fairly plainly without a lot of embellishments and jet jewelry was the only appropriate kind (other than hair jewelry, which we will get to in a moment.) In addition to all of this, widows had to wear veils over their faces. Widows didn’t have to wear the crow look for the whole period of mourning. 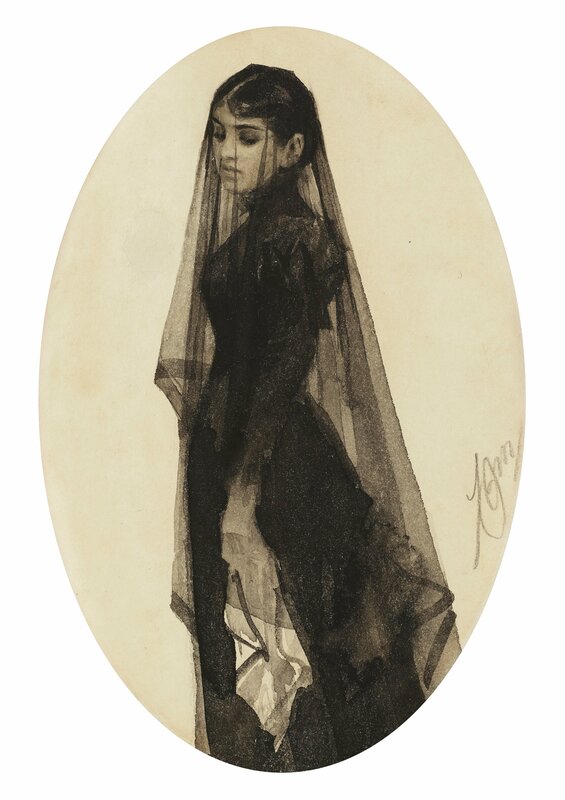 For instance, the widow’s veil could be shortened after the first year! Exciting! The very dark, matte fabric was for deep mourning. For ordinary mourning, you could wear shinier fabrics like silk. For half mourning, you could wear muted colors like grey and lilac. Children wore a mixture of black and white so they wouldn’t look too sad. 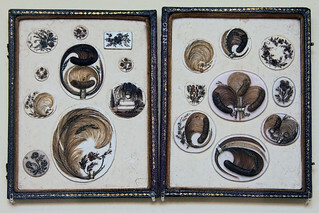 Hair jewelry is pretty much what it sounds like- jewelry made out of hair! It was very popular during the Victorian period because hair does not decay and therefore makes a great memento of a person who has died. The hair could just be a simple lock inside a pretty setting or it could be arranged into fabulous shapes and scenes. Simple braids of hair were also worn as bracelets. 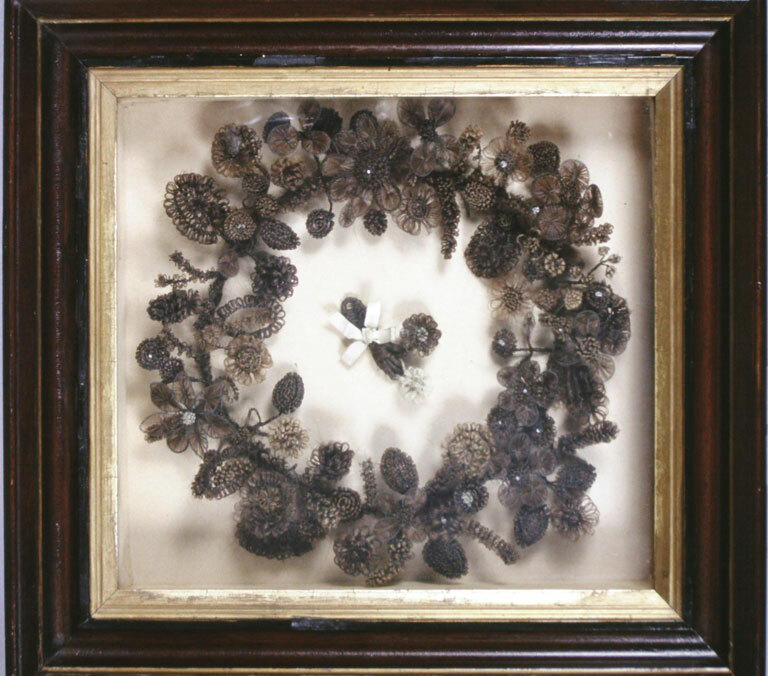 Hair wreaths hung on the walls were also very popular-see if you can spot one the next time you are in a period house museum. Like most things related to Victorian mourning, the trend probably relates very closely to Queen Victoria’s mourning of Prince Albert. In fact, the trend disappeared almost entirely right after her death. Weirdly, only jet jewelry was thought appropriate for deep mourning, though hair jewelry could be worn for the lighter mourning periods. Since mourners were supposed to be sad, they didn’t really go anywhere. It was supposed to have made them more sad to see other people being happy. A rule of thumb was that as long as you were wearing mourning clothes, you shouldn’t go to fun events because mourning clothes and fun clash or something. When you were in lighter mourning you could attend the theater, small functions, and informal events. Photography was first invented during the Victorian period. Combined with extremely high childhood mortality rates, photos of dead people became extremely popular! Sometimes the corpses were shown in a coffin or a bed, looking like they were sleeping. Other times they would be propped up or posed with relatives to look more lifelike. The practice died out (ha-HA!) with the advent of snapshot photography when people started taking pictures of you shortly after you had emerged from the womb and your death photo was no longer the only chance for someone to get an image of you. See some examples here if you are not too faint of heart. As a note, I am calling this Victorian mourning, but Emily Post was still talking about all of this in her 1922 book and Amy Vanderbilt was still talking about it as something that was just dying (ha-HA! again) out in my 1967 edition of her book. I thought the images on the link weren’t too bad…until the young girl with her eyes open, propped on her side. This is really interesting! 🙂 I’m Greek and a lot of people still stick to all the stages of mourning/length of time to wear black etc. No hair bracelets or “lifelike” poses though, thank goodness! That’s really interesting that you still do all the black, I love hearing about other cultures!